You might be stifling your manifesting mojo with one (or more) of these common manifesting mistakes. Mistake #1 Micro-managing the Universe. We all have a tendency to get very specific about what we want and how we want the Universe to bring our desires to us, but often that just slows down the process altogether. The Universe operates by using the path of least resistance and when you get so specific about how you want your desires to manifest, you are essentially shutting down every other possibility that could bring your desires to you with more ease and speed. So, why not let go of the how altogether and simply be open to the magical wonder that is the Law of Attraction I guarantee when you do that, you will find your desires manifesting faster than ever before. Mistake #2 Being overly attached to the outcome. Mistake #3 Letting fear run the show. There are many people who are simply too afraid to ask for what they want for fear they won’t actually receive it. Letting fear run the show is the perfect way to clog your manifesting flow and that’s the last thing you want. Fear has a way of also acting as a messenger letting you know there are some negative vibrations and beliefs that you need to release. One of the best tools for this is to use EFT-Tapping to clear out the old, worn out beliefs that are no longer serving you. By giving your fearful thoughts a voice and releasing the negative energy through tapping, you open up the space for more trust and faith in the Universe, which allows your desires to manifest with ease and grace. Are you being so specific about your desires that you are setting time limits and deadlines If so, this might be part of the problem. For some people, setting a deadline creates more anxiety rather than the free-flowing energy that you need when manifesting easily. As the end-date gets closer, you may find yourself taking score of what you have and haven’t manifested and may begin to worry about how it will show up. If this is a concern for you, drop the deadline altogether and trust the Universe to bring you your desires in the perfect timing no matter what. Mistake #5 Letting your current reality set your vibration and focus. Far too many people are allowing their current reality to be the excuse for not manifesting what they truly desire. The truth is, your current reality is merely an indication of what you were thinking and feeling, so if you don’t like what you see it’s time to shift your focus. 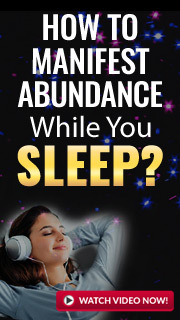 For example, if you are struggling to manifest the money you desire, ignore your negative account balance and focus on feeling abundant in other ways. Another thing to remember is no matter where you are or how bad it seems right now, your situation can and will change in an instant. If your current reality is less than you desire, ignore it and focus on the things that feel good to you now. Mistake #6 Taking forced action. Human beings are known for being logical problem solvers who tend to strategize and plan their way to what they want. The Universe however operates by way of inspiration. Generally speaking there is typically some action involved in manifesting your desires (though it doesn’t always have to be that way), however it must be inspired. If you are finding yourself pushing, planning, or forcing your way to your desires, you are likely making things much harder than they need to be. Lean back a bit and allow the Universe to inspire you to take action when the time is right. When it’s inspired action, you will act accordingly. If you find yourself making any of the manifesting mistakes above all hope is not lost. Simply shift your focus and vibration to the things that feel good for you right now and you will be well on your way to manifesting anything your heart desires. Lamisha Serf-Walls is an empowerment coach for soul-centered women who are tired of trying to fit into lackluster beige boxes and crave the freedom of standing in their truth and living life from the heart. Her mission is to create a community of empowered, free flowing, lovers of life who are co-creating a life they love and inspire others to do the same. You can learn more about Lamisha and what she offers by visiting her Online, on Facebook, or Twitter or grab her free audio 5 Ways to Find Your Passion & Live Your Purpose.